talkhealth > Blog > 2013/05 > A Wedding/Menopause TMI Post! The purse above is the purse I carried on my daughter Katherine’s big day. For Laura’s upcoming nuptials, I thought it would be fun to get a new one. But alas, pennies are spilling from our pocketbooks like lucky rice tossed into the wedding wind. Carrying the same purse again would save a few of those pennies. 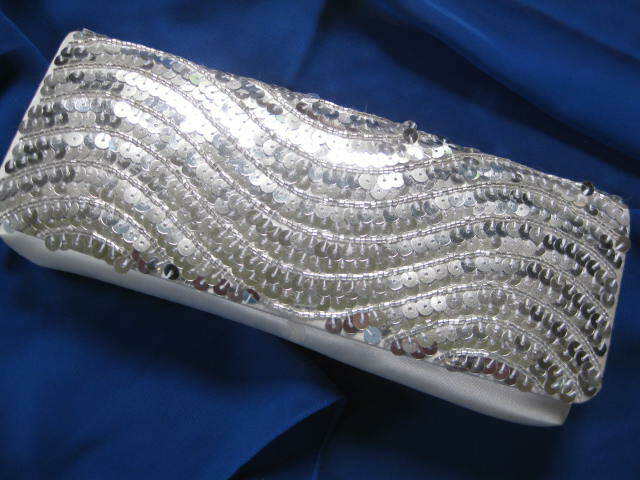 And the silver sequins match the silver beads on my royal blue dress. So I plucked the purse off my closet shelf. A tampon and two safety pins. Don’t need that tampon anymore. Toss it to the wind! 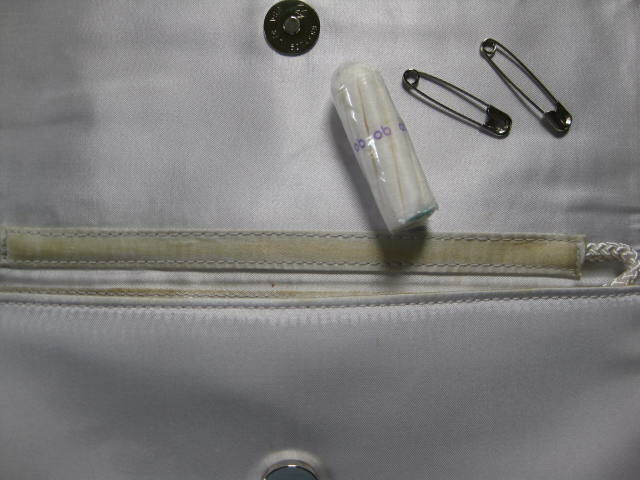 You’ll get your chance to smile when you see a tampon tucked inside an old purse. And that, Dearly Beloved, will be a day to celebrate! P.S. The safety pins are coming along with me. I’m in charge of bustling the dress. Olga, the wedding dress rescuer who created the bustle, demonstrated the process to me. Be still my spinning head.